1. Put the butter in a small saucepan. Place over a moderate heat until the butter begins to turn light golden and smells nutty. 2. Remove from the heat and strain through a tea sieve. 1. Cook the beef burgers according to pack instructions. Remember to rest the meat after cooking. 2. To cook the fried eggs, place a non-stick frying pan over a medium heat. Add enough oil to form a thin layer on the bottom of the pan. Once hot, crack both eggs into the pan. Cook until the yolk has just set, then remove from the pan. 3. Grill the bacon until cooked, but not fully crispy. 4. Place four slices of the tomato into a hot griddle pan and allow to char for a few minutes, then take out of the pan and remove the skin. 5. Mix the HP sauce and mayonnaise together. 6. Lightly toast the brioche buns, cut side up, under the grill. 7. Place the bottom half of the brioche bun onto a serving plate. 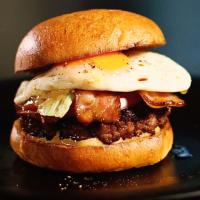 First add some sauce, followed by the burger, two slices of cooked tomato, a slice of raw tomato, a lettuce leaf, two rashers of bacon and some more of the sauce, then finally top with the fried egg. Finish by seasoning with the sherry vinegar and a little of the beurre noisette, then top with the other half of the brioche bun.